Double shanks for Waddington flies. Should be matched with appropriate treble hooks either X1 BL or CS9 BL. Black finish. Waddingtons were designed as a way to tie big salmon flies with a small treble. 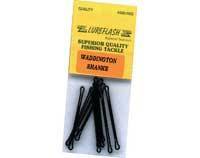 Now widely used with single hooks. Slightly tempered for extra strength. Black finish with a leading up eye. Available in 6 sizes. Treble hooks specially designed to complement our waddington shanks. Round bend, ring eye, strong wire & black finish. 25 per pack. Traditional Waddington Shanks, Black Japanned finish.